GIFTS FOR MEN: GIFT BASKETS FOR MEN | muted. If you’re in a bind looking for a gift then you can’t go wrong with a gift basket. Now I know what you’re thinking, but trust me. The gifts baskets we’ve listed below are definitely for men and any man will love them. If you’re buying for a beer lover we’ve got you covered, a beef lover – covered, whiskey lover – covered. You get the point. Just check out the gifts baskets below, because something tells me you’re under the gun. Gift for the beer lover. I don’t know too many guys who don’t love beer, so you pretty much can’t go wrong with this one. The guys over at Give Them Beer make a great gift basket. 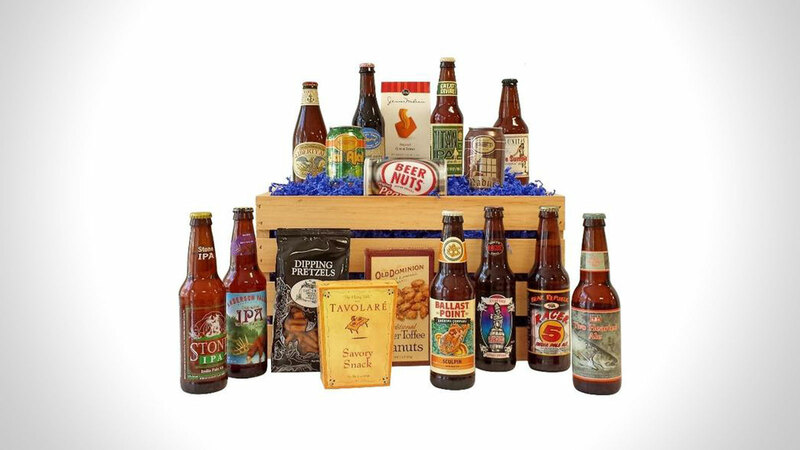 The Give Them Beer Gift Baskets ($60+) offer a multitude of beer choices and containers. You can get beer in steel pails, briefcases, wood crates, or even first aid kits. And If you order by 3pm you can even get same day shipping. And forget about it, they offer some of the best craft beers available. Like I said, you can’t go wrong with a beer gift basket from Give Them Beer. Gift for the bacon lover. Who the hell doesn’t love bacon, I’d love the meet that unicorn, because he doesn’t exist. The ManBuckets Bacon Bucket Gift Basket ($60) is literally for any guy on the planet. 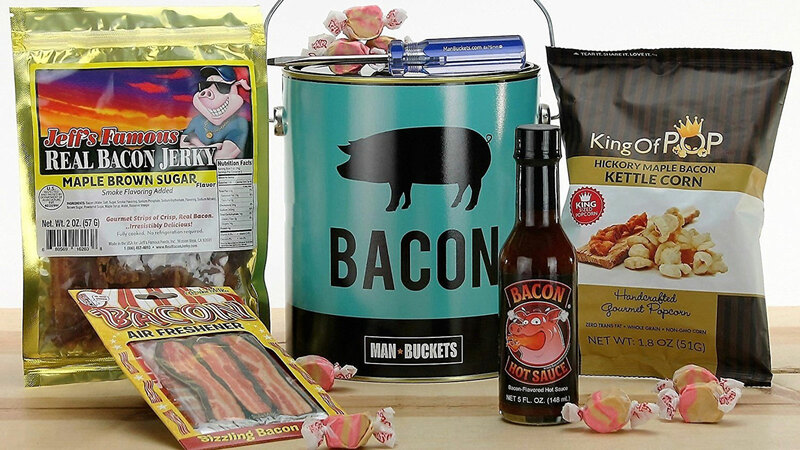 This gift basket comes with awesome bacon grub in a one-gallon steel paint bucket. To start you have to open the paint can with the included screwdriver for prying your way inside. The basket includes bacon jerky, bacon hot sauce, bacon taffy, bacon air freshener, and bacon flavored popcorn. Any more and I would have bacon overload. Just kidding. Gift for the whiskey lover. Ok, I’m a whiskey lover, so this may be one of my favorite gifts baskets. The Personalized Whiskey Crate from Man Crates ($99) has everything a budding whiskey lover and a friend would need. This whiskey basket is delivered in a wood crate that’s opened with an included laser-etched crowbar. None of that fluffy stuff like ribbons here. Once opened you get your main gear. This includes 2 personalized heavy bottom rocks glasses (9 oz. ), 2 Tovolo ice sphere molds, 2 slate coasters, and a 33 drams whiskey drinking journal. 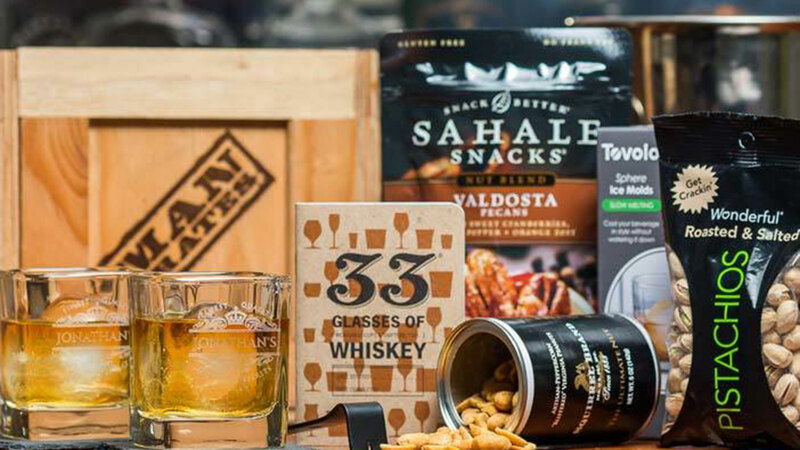 Because regular old snacks would just get overpowered by whiskey, you get squirrel brand spiced peppercorn peanuts, salted pistachios, and Sahale Snacks cranberry becans. Whew! I think I’m in heaven. Gift for the movie lover. I love snacks, particularly movie snacks. 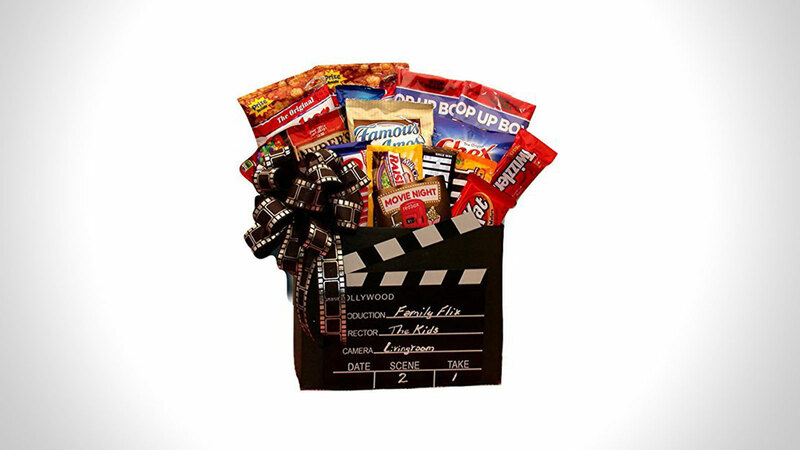 And with the Give Him A Movie Night Gift Basket ($70) you get a boatload of tasty treats. But that’s not all you get. The basket features 6 Redbox movie rentals and a director’s cutting board. Treats include: Twizzlers licorice, Reese’s peanut butter cups, Rice Krispie treat, plain MM’s, Peanut MM’s, Reese’s Pieces, Twix Bar, Hershey’s classic milk chocolate bar, Hershey’s Cookies N cream bar, Nestle Crunch Bar, Snyder’s Pretzels, Chex Mix, 2-butter flavor microwave popcorn, Famous Amos cookies, Cracker Jacks caramel corn with surprise. All of these goodies are delivered in a two tone gift box with handmade movie reel bow. Gift for the meat lover. 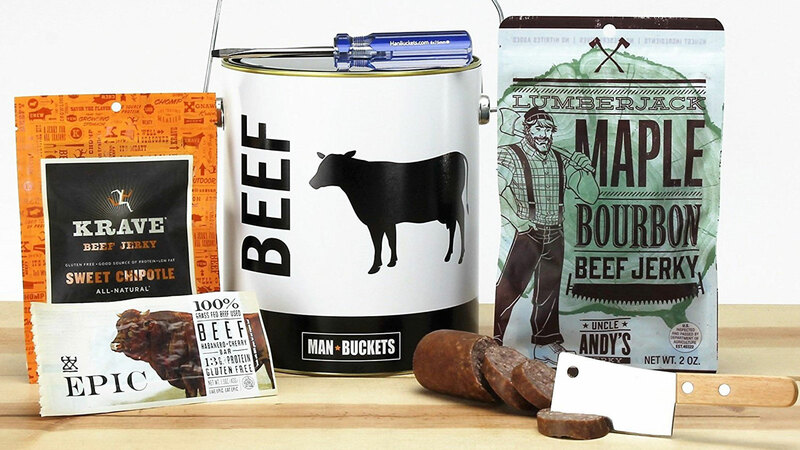 And lastly, we save the best for last, the ManBuckets Beef Bucket Gift Basket ($60) is a meat lovers dream. You get awesome jerky and meats in a manly one-gallon steel paint bucket, that comes with a screwdriver to get that sucker open. Treats in the Beef Bucket include Uncle Andy’s Jerky, Krave Jerky, Summer Sausage, Epic Bar, and of course a meat cleaver. This is a gift basket for real men.